A former Caltech physicist pulls no punches as he recalls his encounters with Richard Feynman. 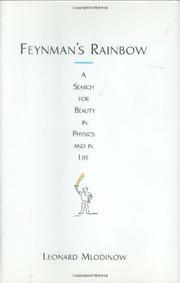 Like many scientists of his generation, Mlodinow (Euclid’s Window, 2001) was attracted to physics by Nobelist Feynman’s published lectures on quantum theory. In 1981, this newly minted Ph.D. found himself in an office just down the hall from his idol. Caltech was then, as now, one of the major centers of physics research: Nobel laureate Murray Gell-Mann was in the office next door, and another faculty member at the time was John Schwarz, the leading advocate of a then-disreputable notion that would eventually blossom into string theory. Uncertain what he was doing in such high-powered company, Mlodinow had long talks with Feynman about every aspect of science and life. The physicist permitted his young colleague to tape some of their conversations, and this account is based in part on transcripts of those tapes, interspersed with Mlodinow's reminiscences about life at Caltech. Neither the author nor his famous not-quite-mentor were comfortable in academic culture. Feynman was a notorious nonconformist, often working on physics in strip clubs, or eating lunch at the student union instead of at the elegant faculty club. Mlodinow spent much of his free time smoking dope and watching old gangster movies with working-class friends. He dabbled in fiction writing, a pastime most of his scientific colleagues regarded with suspicion if not outright scorn. Feynman did what he could to assuage Mlodinow's trepidations about a physics career, offering insights into scientific creativity and the nature of physics, as well as more general topics. Already diagnosed with the cancer that would eventually kill him, Feynman had arrived at unconventional conclusions about the world at large. Inspiring and very readable portrait of a free-spirited genius.